8.1 The Geological Time Scale The work of William Smith was critical to the establishment of the first geological time scale early in the 19th century, but it wasn’t until the 20th century that geologists were able to assign reliable dates to the various time periods. The geological time scale is now maintained by the International Commission on Stratigraphy. Geological time is divided into eons, eras, periods, and epochs. 8.2 Relative Dating Methods We can determine the relative ages of different rocks by observing and interpreting relationships among them, such as superposition, cross-cutting, and inclusions. Gaps in the geological record are represented by various types of unconformities. 8.3 Dating Rocks Using Fossils Fossils are useful for dating rocks date back to about 600 Ma. If we know the age range of a fossil, we can date the rock, but some organisms lived for many millions of years. Index fossils represent shorter geological times, and if a rock has several different fossils with known age ranges, we can normally narrow the time during which the rock formed. 8.4 Isotopic Dating Methods Radioactive isotopes decay at predictable and known rates, and can be used to date igneous and metamorphic rocks. Some of the more useful isotope systems are potassium-argon, rubidium-strontium, uranium-lead, and carbon-nitrogen. 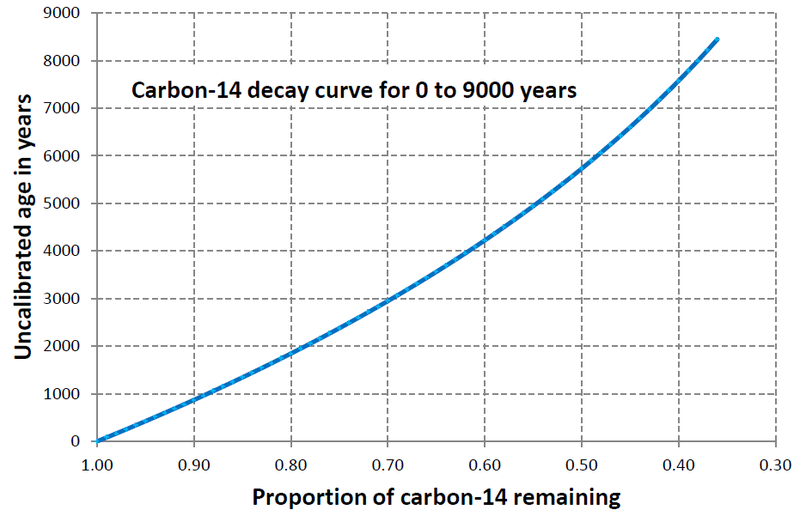 Radiocarbon dating can be applied to sediments and sedimentary rocks, but only if they are younger than 60 ka. 8.5 Other Dating Methods There are many other methods for dating geological materials. Two that are widely used are dendrochronology and magnetic chronology. Dendrochronology, based on studies of tree rings, is widely applied to dating glacial events. Magnetic chronology is based on the known record of Earth’s magnetic field reversals. 8.6 Understanding Geological Time While knowing about geological time is relatively easy, actually comprehending the significance of the vast amounts of geological time is a great challenge. To be able to solve important geological problems and critical societal challenges, like climate change, we need to really understand geological time. 1. A granitic rock contains inclusions (xenoliths) of basalt. What can you say about the relative ages of the granite and the basalt? 3. What are the features of a useful index fossil? 4. 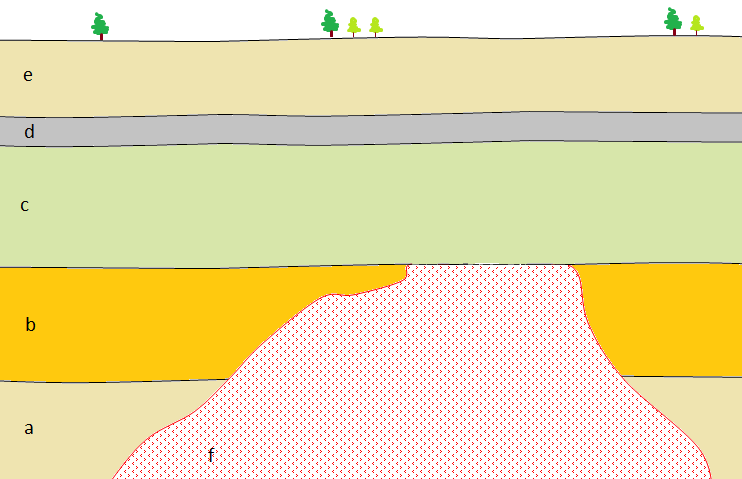 This diagram shows a geological cross-section. The granitic rock “f” at the bottom is the one that you estimated the age of in Exercise 8.3. A piece of wood from layer “d” has been sent for radiocarbon dating and the result was 0.55 14C remaining. How old is layer “d”? 5. Based on your answer to question 4, what can you say about the age of layer “c” in the figure above? 6. What type of unconformity exists between layer “c” and rock “f”? 7. What about between layer “c” and layer “b”? 8. We can’t use magnetic chronology to date anything younger than 780,000 years. Why not? 9. How did William Smith apply the principle of faunal succession to determine the relative ages of the sedimentary rocks of England and Wales? 10. Access a copy of the geological time scale at http://www.stratigraphy.org/index.php/ics-chart-timescale. What are the names of the last age (or stage) of the Cretaceous and the first age of the Paleogene? Print out the time scale and stick it on the wall above your desk! Chapter 8 Summary by Steven Earle is licensed under a Creative Commons Attribution 4.0 International License, except where otherwise noted.